You are at:Home»Great Falls Montana»Around Town»Guess Who? 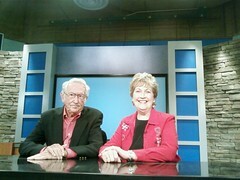 Today is chock-full of fun at KRTV — here’s two of our *very special* guests: Dan Snyder & Norma Ashby! Look for them to make an appearance on the 5:30 news today! UPDATE: the image links to the video of Dan & Norma spending a few minutes strolling down memory lane! And the video of David Letterman wishing KRTV a happy birthday is there, too.